I’m going to come out and say it: This recipe is a total cop-out. Seriously. It’s so SIMPLE. It’s not even a recipe. It’s more like this thing that I do when I feel slightly desperate about figuring out what should go into the kids’ lunches that day, and darn it all, somehow this total act of lunchbox desperation has become one of their very favorite things to eat. Go figure. Kids — you bend over backwards to make them awesome lunches, and the things they end up loving the most are the things you barely even think COUNT. But regardless, they DO love this, and I couldn’t in good conscience write a lunchbox edition with a thermos installment and not include the much-adored pizza chicken. I’ll just keep telling myself that it’s totally justifiable by virtue of the fact that if you think about it, it’s really kind of a cheater’s chicken parm. Right? 2 oz. cheese of your choice — mozzarella, muenster, whatever’s hanging out in the fridge. I’ve even done goat cheese in a pinch. It also doesn’t matter if it’s sliced or shredded, as long as it will melt. In a small saucepan, heat the marinara until bubbling. Add the chicken and reduce the heat; simmer for about 5 minutes, to heat everything through. 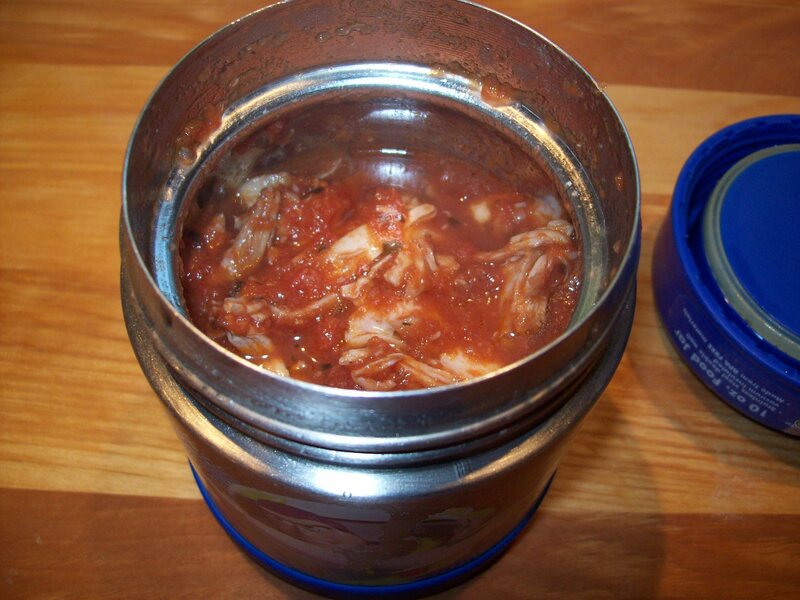 Pour the chicken and marinara mixture into a preheated thermos, add the cheese, stir quickly, and put the lid on securely.